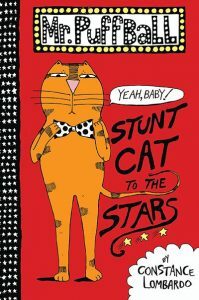 Who doesn’t love a book about a skateboarding cat who wants to be an actor? I really enjoyed Mr. Puffball Stunt Cat to the Stars because it was really funny and I was able to make some good connections to the characters. The main character, Mr. Puffball, and I are alike because we both like to skateboard, he wants to be famous just like me and he has lots of friends like I do. I liked how the author took places and names of famous people and put a “cat” twist on them, like Purramount Studios, Cleocatra Meets the Mummy, and Hairy Pawter. The book starts out with Mr. Puffball being a kitten in New Jersey. He moves to Hollywood to follow in the footsteps of his hero actor, El Gato. Mr. Puffball’s adventure to get to Hollywood includes meeting some interesting characters along the way that help him to fulfill his dream. Mr. Puffball learns that it takes a lot to become an actor and that to become famous he may need to go about it in a different way. My favourite character is El Gato because he is an action star which is my favourite type of movie. I like how El Gato changed at the end of the story after learning about himself from his friends. One of my favourite parts is when Mr. Puffball goes skateboarding on his way to Hollywood because I can do the same tricks as him. This book is a good choice for anyone who likes books with silly characters and is into cats and for readers who like graphic novels.